Flipz have always been a favorite movie treat for me, and when I went to see Bruno yesterday, these looked too good to pass up. 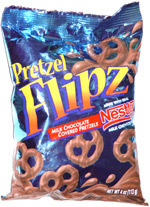 One of my favorite things about Flipz is that there’s a perfect balance of crunch and cream, of salt and sweet. These were a little different in that they were “double dipped” and thus a little thicker on the coating than the other varieties of pretzels. This particular coating was a layer of peanut butter and then a layer of chocolate. Biting into this was a soft bite, then the pretzel crunch. The flavors came together well, but the peanut butter was far more subtle than I’d thought. In the bag, which was about three dollars, there were twenty mini pretzels, a bad value, in my opinion. The chocolate was good, a little mockolate tasting, but not so bad. Overall, I far appreciate homemade chocolate covered pretzels or at least ones with better flavor coverage. Next Next post: Updates and how I can spy.